Gangnam Finance Center connected through Yeoksam Station on line 2 has many selections of restaurants for the office workers in the area. It's always crowded and there are many foreigners about too. 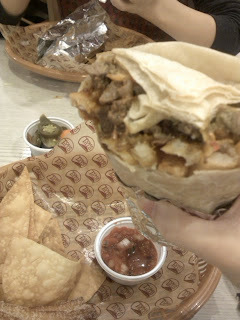 The last time we tried a Korean chicken place, but this time round M and I went to Tomatillo, for some Mexican food. Mmm!! Tacos for M, burrito for yo, filling to the max.